Home » Advocacy » Affordable Today. Affordable Tomorrow. Why indeed? Non-profit and co-op housing has proven to be the most effective way to create affordable homes and keep them affordable. 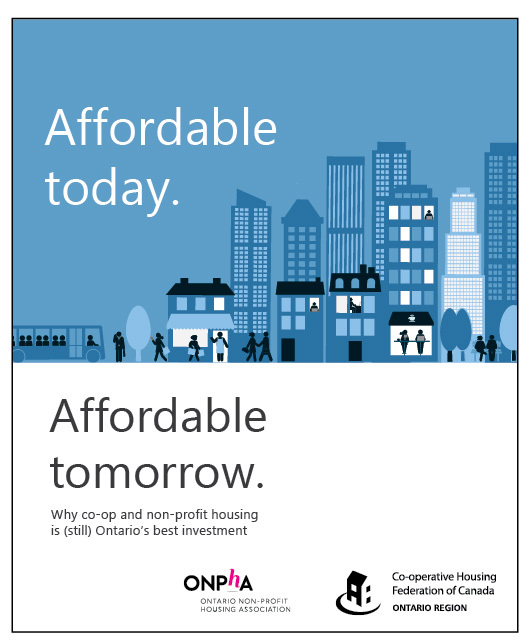 With the Provincial election fast approaching and new funding opportunities coming down the pipe through the National Housing Strategy, ONPHA has teamed up with our sector partner CHF Canada to make the case for investing in co-op and non-profit housing today to create a legacy for the next generation. Our joint value proposition Affordable Today, Affordable Tomorrow: Why cop-op and non-profit housing is (still) Ontario’s best investment is an advocacy tool to help us spread the word about the critical role co-op and non-profit housing plays in achieving a bright housing future for all Ontarians. View the document now on our website. Help us spread the word by sharing this with your networks. Today in Ontario, 525,000 people are benefiting from investments made by previous governments. Together, let’s make sure today’s housing dollars are still working for the next generation of Ontarians.